On C-Span, Carter recently talked about his funeral plans. He needs to plan his funeral and also make reservations at a Retirement Home. Many Georgians would like to see him off the national stage. We have endured his hypocrisy and incompetence long enough. I voted twice for Jimmy Carter for President because he was a Georgian. I did not vote for him for Governor against Carl Sanders in 1970. For years now, I have come to despise Carter’s piety and hypocrisy. 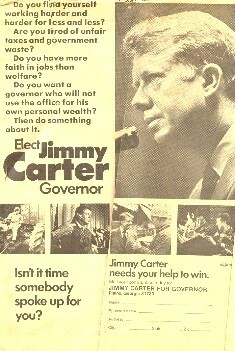 Jimmy Carter came on the scene in 1966 as an unknown (Statewide) Senator who announced for Governor in the Primary. I initially voted for him and preferred him over Lester Maddox who became Governor by votes of Legislators. Carl Sanders had been Governor from 1962 to 1966. I was in the Army during part of his term and at the time Lemuel Penn was slain in Georgia.Carl Sanders handled a terrible situation in a responsible way.With his leadership, Georgia did not have the racial strife of Arkansas, Mississippi and Alabama.He was the first modern Southern Progressive Governor that faced Race Relations in a responsible manner. I supported Carl Sanders when he ran again in 1970.His opponent was Jimmy Carter who was portraying an image of a “Peanut Farmer” from South Georgia. He and his crowd nicknamed Carl Sanders as “Cuff Links Carl” since he had become a very successful Attorney. When Carter beat Sanders, many Oconee and Georgia Farmers had helped him and liked to tease us Sanders supporters. Soon after the election, Carter changed “spots” again and became a Civil Rights Governor. In time, he was hated by most Georgia voters who had elected him.He was successful in parlaying that Peanut Farmer image into the primaries and got the Democratic nomination for President.After Watergate, he seemed to have special appeal to the country although he was never a good speaker. Well, for good or bad, his national record is well known.To me, the Iranian Hostage Crisis of the late 70’s (and the botched rescue mission) was the lowest point for America in my lifetime.The Iranian demonstrators hung Carter in effigy and made him the target of their hatred at that time.Voters sent Carter packing in the 1980 election.For a while, he worked with Habitat for Humanity and on world peace.In time, he started acting like he was “President of the World”.Many of his mistakes (North Korea) and some Latin American Countries and his cozy visit to Fidel Castro’s Cuba, all started diminishing his stature in my eyes. In the last five years, Carter’s comments and criticism of President Bush has demonstrated his mean-spiritedness and hypocrisy. His performance at the Coretta Scott King Funeral and sitting with Michael Moore at the 2004 Democrat Convention caused me to lose all respect for him.I think he is a failed, overly-pious hypocrite! On C-Span, Carter recently talked about his funeral plans. He needs to plan his funeral and also make reservations at a Retirement Home.Many Georgians would like to see him off the national stage.We have endured his hypocrisy and incompetence long enough. Two significant developments came out of Carl Sanders’ race for governor in 1970 against Jimmy Carter. First, unlike Carter, Sanders refused to compromise his principles to get elected. Second, once the election was over, the former governor decided to leave the political arena and devote himself to building his law practice. Today, Troutman-Sanders, which he serves as chairman emeritus, is one of the 100 largest law firms in the United States, with more than 650 attorneys. Sanders has done well. The dirty tricks he endured included a picture widely circulated in south Georgia showing Sanders, a part-owner of the Atlanta Hawks at the time, celebrating a victory with his arms around Joe Caldwell, a black player. Carter and his apologists have long denied any culpability, but veteran political columnist Bill Shipp told me he saw Bill Pope, Carter’s press secretary, hand out leaflets with the photograph at a Ku Klux Klan rally. Dot Wood, a good friend and former vice president of Gerald Rafshoon Advertising, which handled Carter’s media, confirms the story and said she saw boxes of the leaflets in the office. Carter, by the way, got only 5 percent of the black vote in the campaign. During the campaign, Carter also criticized Sanders for his support of then-President Lyndon Johnson. Author Jim Cooke in his biography of Carl Sanders says that Sanders underestimated Carter and thought people would see through Carter’s facade of portraying himself as a George Wallace-styled redneck. He refused his staff’s recommendations to fight back until it was too late, and Carter was elected governor. Of course, once elected, Carter changed his tune, severely disappointing the arch-segregationists who has supported him. Call me naive, but I don’t think he and his apologists are anxious for you to see them. I can understand why. His image is bad enough. Why make it worse? Carter’s hypocrisy evidently knows no bounds. After a dinner for former governors at the Governor’s Mansion, Carter told the news media that he owed so much to Sanders for making Georgia such a progressive state and how much that image helped him in his presidential campaign. Pondering that comment, Sanders just shakes his head and smiles. I couldn’t have said it better. His leadership pulled Georgia through one of the most difficult periods in our history, and he left the state much better than he found it. Most importantly, he did it with integrity. The man is a class act. This Column also appeared in The Athens Banner-Herald and other newspapers…. Young Harris College and the Institute for Continuing Learning are proud to present a series of fascinating and provocative seminars entitled, "Reflections on Georgia Politics." The seminars, which are open to the community free of charge, provide participants with an inside look at Georgia's public servants over the past five decades. Noted political historian and campaign consultant Bob Short will lead a discussion with former Governor Carl Sanders on Thursday, December 7, beginning at 3:15 PM in the Goolsby Building's Wilson Lecture Hall on the campus of the College. Carl Sanders is best remembered as Georgia's first New South governor, a Democrat who provided progressive leadership for the state from 1963 to 1967.